UNC Asheville’s Events and Conferences Office provides programming and services that serve as a bridge connecting our campus community of students, staff and faculty to our local, state, regional, national and international communities through the arts and non-credit academic programs. UNC Asheville’s Lipinsky Auditorium seats 580 and is the home venue of our Cultural Events series. We have presented scores of sold-out, world-class performances and lectures of every genre for 30+ years. The facility is an excellent listening room for the diverse audiences we draw from among our 3,000+ students, 700+ faculty and staff, and the larger Western North Carolina community. UNC Asheville is the premier liberal arts university in the UNC system, and the Asheville arts community that surrounds us is vibrant and eager to experience the work and perspectives of performing artists who visit our campus. Ticket prices for our series range from $5-$15. UNC Asheville student tickets are free. Visit our Events Calendar to find upcoming events. Every summer, UNC Asheville welcomes thousands of community members to the campus for our free summer music series Concerts on the Quad. Concerts on the Quad features music of all kinds, including Country, Soul, Jazz, Latin and Funk Music. Concerts take place on Monday evenings in June and July. Concert-goers are invited to bring lawn chairs, blankets and picnics to enjoy along with the music, and meals, treats and drinks are typically available. 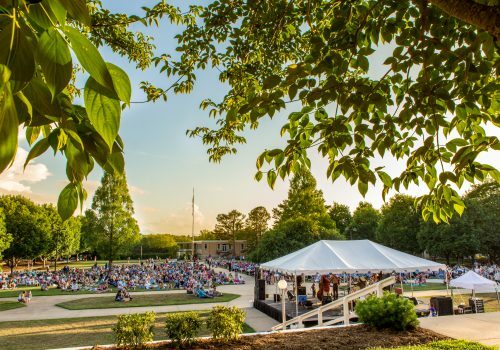 Stay tuned for information on our 2019 Concerts on the Quad.